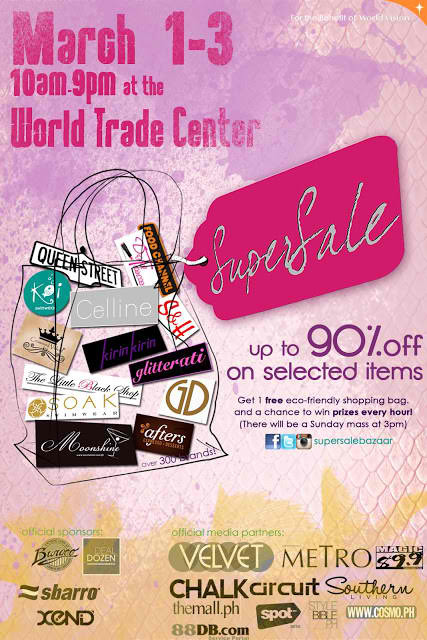 "The Beauty Geek": It is Super Sale Bazaar Once Again! It is SUPERSALE BAZAAR once again!! Are you all excited?? Have you all saved up for it? If you did, then good for you! If not.. remember, it is pay day on the 28th! Just in time for you to splurge on this event! Believe me, it is worth it, for many of your suki online shops will be on SALE!! I was not able to attend the last SuperSale bazaar because I was so busy and I regret it. I had a friend buy stuff that I needed there because they all have great discounts that are too hard to pass up. That is the reason why I am yearning for this one now. I was really excited to receive this flyer when a package was sent to me from my most recent Multiply transaction. Aside from looking for great make up finds, it is also the right time to search for the perfect swimwear as summer is fast approaching! It is up to 90% on selected items so this has got to be a great one! I really can't contain myself from all this excitement! See you ladies hauling around!